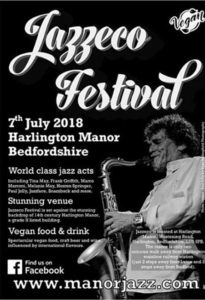 Ginny and I were privileged to be invited to the inaugural Jazzeco Festival in the grounds of picturesque Harlington Manor, Bedfordshire, on Saturday, 7th July. The sun shone and the fans amassed to enjoy the jazz and the plentiful Vegan food and refreshments – or simply to wander around the stalls with their resplendent displays. And I filmed for posterity! Open air stage acoustics and lighting aren’t always the best for filming larger groups at such events. Nor can fans be expected to give way to the camera man, especially when they are eager to take their own photos and movies. But I was delighted to film several numbers of co-organiser, Melanie May on stage along with Russell Williams on keys, Laurence Evans on bass, Frank Griffith Clarinet and Saxophone and Les Cirkel on drums. Regrettably due to extenuating circumstances I was not able to stay on for the full programme. But the cast also included jazz diva Tina May backed by The Frank Griffith Quintet (Frank was formerly sideman to Buddy Rich and Mel Torme). Melanie May also performed with her own band. Another time, Melanie!